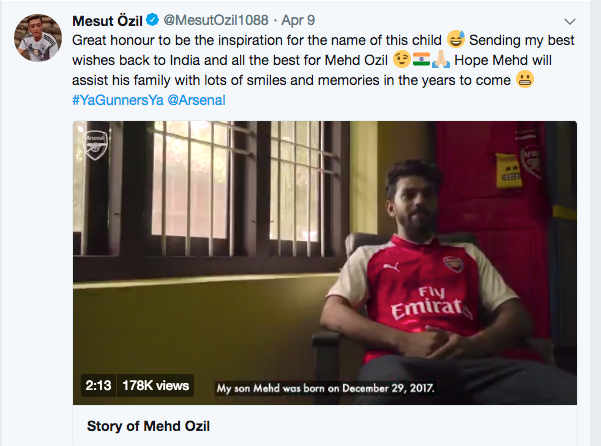 The couple from Kerala who named their son after Arsenal’s star playmaker, Mesut Ozil received a special surprise when the footballer sent the family a message appreciating the gesture. Inzaman-Ul-Haq and Fida Sanam, a young couple from Kerala have named their little boy Mehd Ozil. Inzamam who is a huge fan of Ozil and decided to pay a tribute to his favourite footballer by naming his first born after the star Gunner. Having considered naming the kid Arsene Wenger, he opted for Ozil (with Mohamed Elneny his back-up option). Representatives of the London-based club, which has been the champions of the English league 13 times, were in Kerala last month to meet the couple who live in Malappuram district’s Manjeri town. We’ve got Ozil, Mehd Ozil? 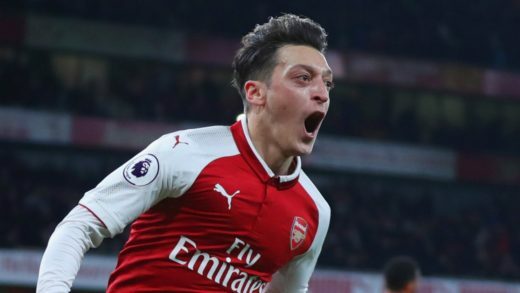 On Monday Ozil shared the video on his social media channels and wished his new namesake well. ‘Great honour to be the inspiration for the name of this child,’ he wrote. ‘Sending my best wishes back to India and all the best for Mehd Ozil. Hope Mehd will assist his family with lots of smiles and memories in the years to come’. A sweet gesture by Arsenal and Ozil that must have made the little Mehd, his father and a whole lot of fans in India very happy.